Experience the gritty and uncompromising Punisher MAX from the very beginning! When a mob hit killed his beloved wife and children, Frank Castle became the Punisher - an unstoppable one-man army waging war on every piece of criminal scum plaguing New York's streets. 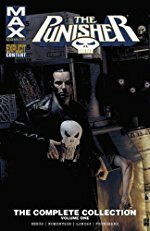 But do the Punisher's origins trace back even further? In 1971 Vietnam, Captain Castle's platoon faces a Viet Cong attack...and to survive, he must make a grim choice. This is my first read ever of any Punisher stuff. Seems like a great place to start. Very simple character with some intriguing origins. Pretty terrifying though, doesn't pull any punches and has some very disturbing violence. The art is just incredible as you'd expect from this team. So I bought all of the Ennis Punisher MAX during the insane Kindle Marvel sale. It cost me like $15. It looks awesome! But I haven't read it yet. But I will! Yep, easily the best stuff Ennis has ever done, and the best Punisher stories ever told. He can't take his hand off the Irish for too long which, if you're familiar with any of his other work, is fairly well-trod and frankly quite hackneyed territory for him, and it appears here as well, but still, good comics.